Catholic Church leaders have criticised new ACT laws that would force priests to break the seal of confession to report child abuse, saying the clause would make children "less safe". Source: Canberra Times. Priests in Canberra will be required to report allegations, offences or convictions related to children to the ACT Ombudsman within 30 days from March 31, 2019 - even if the information was gleaned in the confessional. Under church law priests can be ex-communicated for breaking the seal of confession. But the Australian Catholics Bishops Conference (ACBC) wrote to ACT Chief Minister Andrew Barr with "grave concerns" about the laws, saying mandatory reporting from the confessional "will either have no effect on child safety or will actually make children less safe". "Firstly perpetrators of this terrible sin very rarely seek out confession and if mandatory reporting of confessions were required they would certainly not confess. There would be no effect on child safety," reads the letter signed by ACBC President Archbishop Mark Coleridge and Vice President Archbishop Anthony Fisher. "Secondly any perpetrator who was minded to confess would almost certainly do so anonymously so no mandatory reporting would be possible. Again children would be no safer. 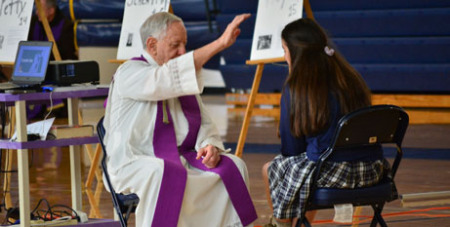 "Thirdly were trust in the absolute confidentiality of confession undermined then any chance a victim would mention this in confession to a priest would also be seriously diminished; any chance a priest-confessor might have to impress upon the victim the need to inform responsible adults outside confession and get to safety would also be lost. Children would be less safe." Mr Barr's letter of reply said the Royal Commission into Institutional Responses to Child Sexual Abuse received evidence that some perpetrator priests had confessed to their abuse in the confessional, and was satisfied the sacrament played some part in both the occurrence of abuse and its cover-up. "Child abuse is appalling and my government is unwavering in its approach to keeping children safe, wherever they are,” he said.